So. Good, mad, full-on New Gods vs. Apokolips action in today's issue! The giant pink whale monster that the Deep Six create is really pretty amazing, especially it's battering ram growing from beneath its jaw. But there's also a weird little subplot about a man and his two children who are caught up in this conflict. The son is a conscientious objector, the father a conservative military man, and the daughter is...well, kind of whiny and useless, actually. 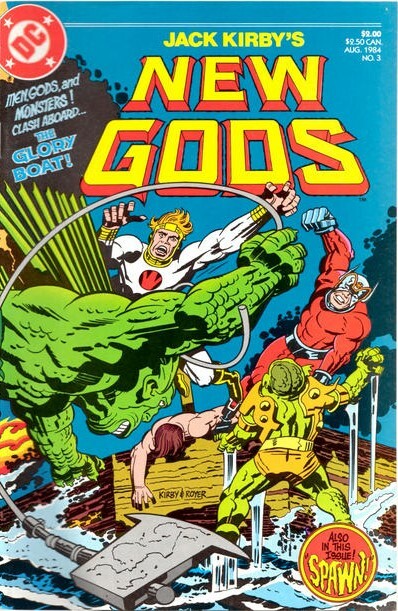 I'm seeing this as a trend in New Gods. None of the female characters are really very necessary. This subplot plays out as one might expect, as the son eventually sacrifices his life to save father and sister, and the father sees that war really does have horrible consequences, and maybe his son wasn't so wrong after all. But the weirdest part is that in the end, literally the final panel of the comic, after the Deep Six have been defeated, as has the whale monster, and Orion and Lightray have left, the father is still there, tied to the mast of what used be his yacht. And he's left there, wondering about all that he believed and all he lost. I was not expecting an ending like this, but as I think more on it, it fits with the mythic tenor of the series. The gods leave the man there because they know that on a symbolic, archetypic, level, it's the place that he's meant to be. It's almost like they're aware of the way in which they themselves, as icons in a comic book, must move and act in order to tell the kind of story they need to tell.